Riegl USA is proud to announce the latest features for the RIEGL Software Suite. This all inclusive software suite is fast, cost effective, and extremely user friendly. Thus no other third party software is required to produce accurate geo-referenced point clouds for LiDAR with RIEGL equipment. 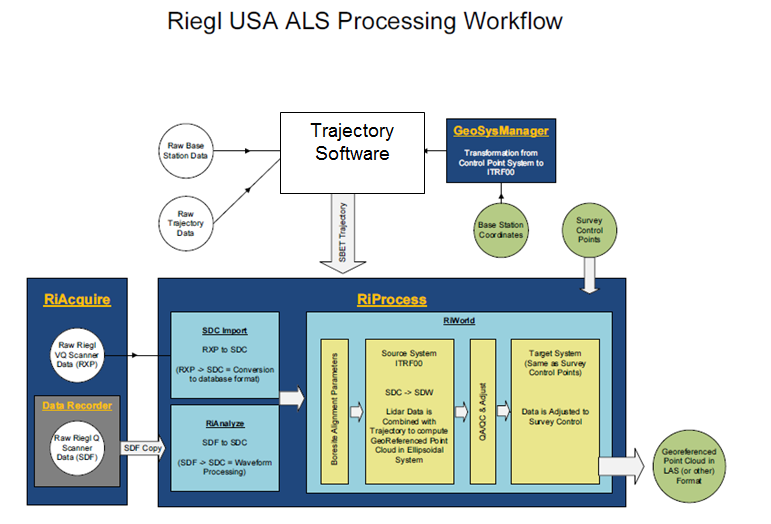 The RIEGL RiACQUIRE software allows for real time data monitoring and recording of LiDAR data, image and trajectory. The RIEGL RiPROCESS software is the shell that enables perfectly calibrated LiDAR point cloud data to be delivered for the airborne and mobile data processing user. The integrated boresight algorithm provides for faster and more accurate planar surface matching which checks overall system component calibration resulting in correct data alignment in the raw data and scan data adjustment. The RIEGL RiANALYZE software allows the LiDAR user to extract and digitize the targets from full waveform pulse returns. The RIEGL RiWORLD software combines LiDAR and trajectory data that produces real world point clouds. RIEGL GEOSys Manager is a LiDAR data management tool for coordinate systems and projections. RIEGL POF-Import is a trajectory conversion utility for LiDAR processing. Allows for importing quality information about the trajectory.